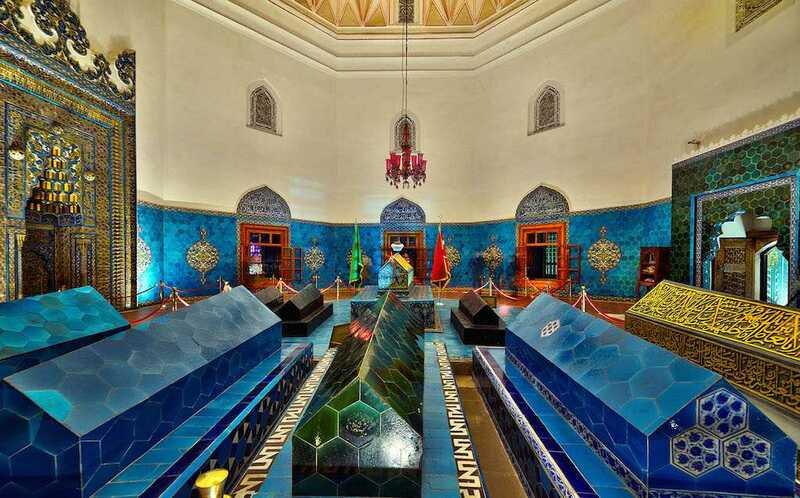 Due to its bluish green tiles and the turquoise color used in the ornaments, named as ‘’Green’’ the mihrab of that structure is 10 m high and reflects one of the best samples of tile decoration. Because the greater part of the Green Mosque is covered with tiles, they symbolise the brilliance of “Green Mosque”. 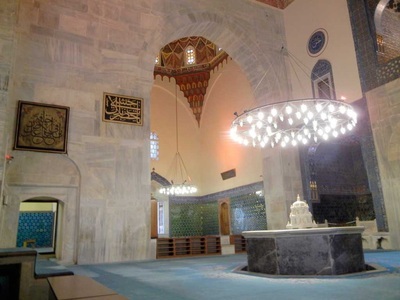 The gathering place for the muezzin is also furnished with tiles to the Bursa arc. The place of the Sultan is also ornamented with deluxe tiles. The extra tiles at the place of the Sultan are decorated as flowers. Because of that, this mosque is also regarded as a masterpiece with its fascinating tiles. Planned as a reverse T-plan and the facade made of marble, the mosque includes four adorned windows, which contain two mihrabs and four niches with railings. 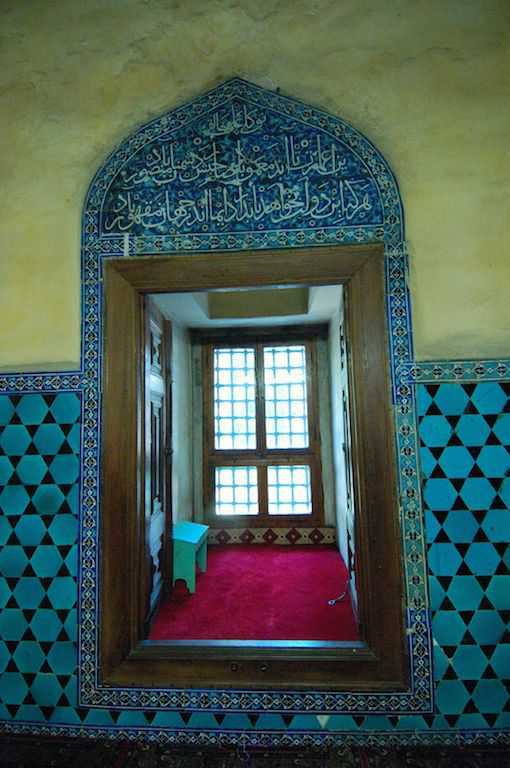 One of the best examples of ornamental stonework in Turkey, the windows of the Green Mosque consists of interesting incomplete scriptures around them. The stalactite gateway of the mosque was completed for three years and it has a monumental sight. You can get information about the building of mosque from the inscription upon that gateway which is 2-3 meters long. There are two Byzantine columns inside this vestibule. This vestibule opens to side rooms at the eastern and western parts, which are groined vaulted, the low entrances opens to the middle chamber. The masterpiece mihrab of the mosque furnished with tiles. It is higher than 10 meters. Adorned with geometric motifs and flowers, the mihrab is thought as the summit of the tile works. The iron sections used in doors, windows and cupboards are masterfully crafted. There is no final community place in Green Mosque. It is believed that the construction of it had started however was not completed due to the sudden death of the Sultan. There are assertions that the Green Mosque has been established as a council of state. The minarets of the mosque have been rebuilt in the 19th century. 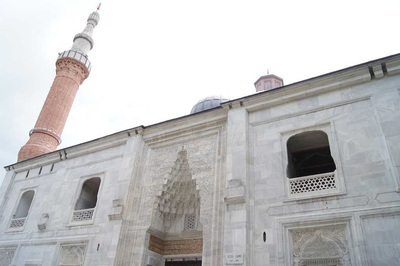 The face stone and brick were used in the building of Green Mosque’s Madrasah named Sultaniye. It has 100 meters distance from that mosque. Also surrounded by a rectangle courtyard and porches with dome, madrasah contains a training center and the rooms for students. Moreover there is a pool with sprinkler made from the marble in the middle of that yard. There are no any ruins about the Turkish Baths built in Sultan Fatih Mehmet, the Conqueror. The bathhouse is used as a commerce center today. 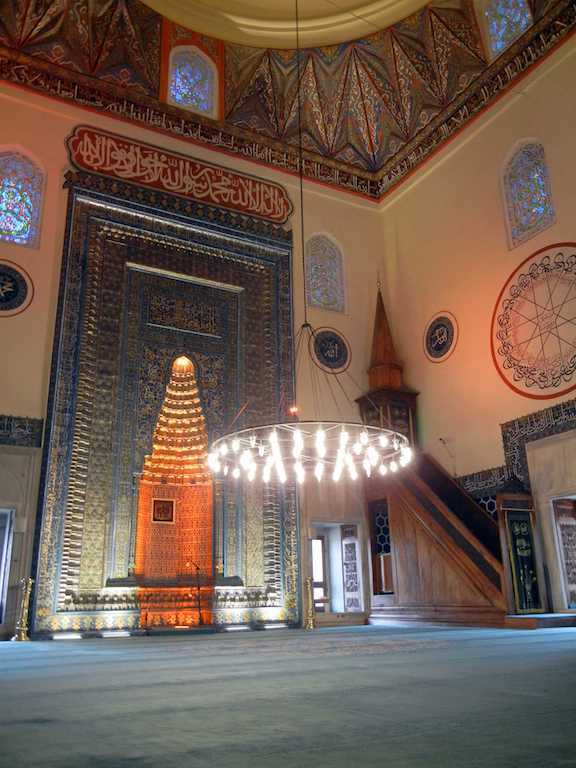 Established by Sultan Çelebi Mehmet in 1421, Green Tomb is placed on the hill accross to the Green Mosque. Its architect is skilful artist Haci Ivaz Pasha. 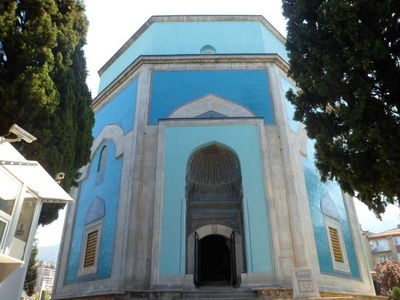 One of the most important mausoleums in Bursa, that tomb is called as Green thanks to its covered with the green tiles. The tomb is constructed on an octagonal plan and the burial vault at the lowest floor looks like Seljuk vault. Covered with the bullet, dome of that structure has eight magnificent windows which create a heavenly ambiance here. The tiles used for window pediments are furnished with verses of the Koran and Prophet Mohammad’s deeds. Additionally, the door of splendid mausoleum was made of the walnut tree. It was ornamented with green tiles, rosette, rumi and geometric adornments.Those mosaic tile emblazonments in the tomb are uniquely beautiful. Mihrab of the tomb with extraordinary tiles fascinates the people even today. Therefore this mihrab with colorful and geometric tiles is regarded as an artistic masterpiece. 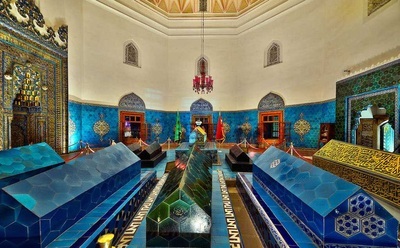 In the middle of the octagonal Green Tomb, there are many sarcophaguses belonging to Çelebi Sultan Mehmed, his sons Mustafa, Mahmud and Yusuf and his daughters Selçuk Hatun, Sitti Hatun and Ayse Hatun and also Daya Hatun the governess of Çelebi Sultan Mehmed. Also Inscriptions are carved on the white, blue, yellow and navy blue tiles of that sarcophagus.